Capture air, add a little pressure, and you create a remarkably resilient, energy-absorbing surface. Built into a case, inflation will protect your firearm or scope as well as any hard case. Because air is lightweight, so is an Air Armor Tech case. Our gun cases are so lightweight that we built backpack straps in them for hands-free transportation. If you aren’t so sure of the ability of air-filled fabric to protect your treasured gun or crucial scope, consider the airbag in your vehicle. Like our cases, the airbag creates an energy-absorbing surface designed to protect something of significant importance (your life!) from blunt-force impact with a steering wheel or dashboard. Similar to Air Armor Tech cases, an airbag is made of premium, high-performance fabrics designed to use air for maximum protection. Need we say more? But, that’s where the similarities end. Arrive at your destination and a protective hard case becomes a space-wasting nuisance, while an Air Armor Tech™ inflatable case deflates to just 15% of its inflated size. And, because it’s made of fabric instead of plastic or aluminum, you can roll it up for easy stashing. 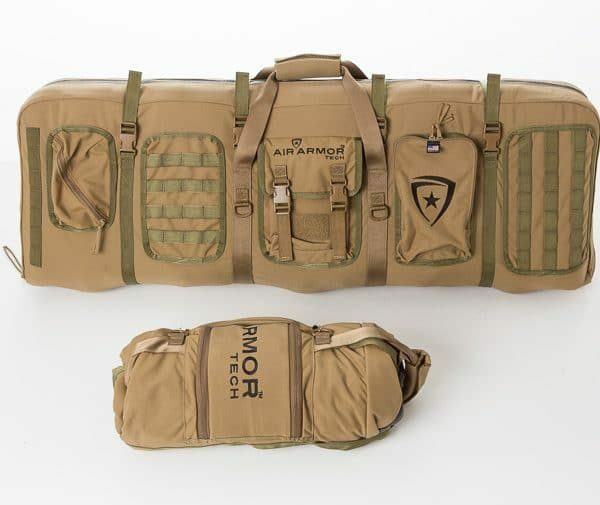 The Air Armor Tech case contains a premium, high-performance air bladder that was specifically designed to encase your firearm or scope in protective air. Made of a highly durable material, the air bladder inflates (and deflates) quickly and easily with a hide-away inflation port. This means that when not in use, you simply deflate your case, roll it up and stash it away.